Sometimes it’s the unplanned stuff that makes a ride great. 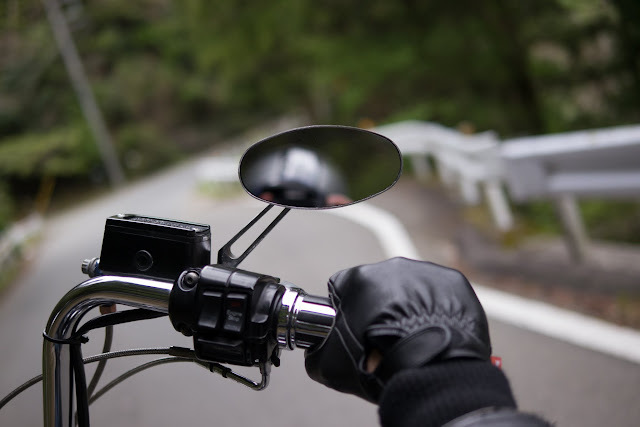 Last week I headed toward Nagano for what I thought would be a short solo touring trip before meeting up with friends for drinks, but on my way to the expressway, my friend Go suddenly pulled up next to me at a stoplight. 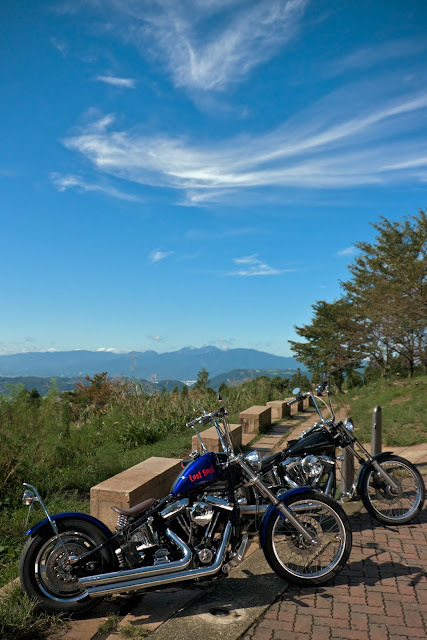 He was also headed toward Nagano, and mentioned that he was thinking of riding along the Venus Line, one of my favorite roads. I had originally planned a pretty straightforward route to my destination, without much non-expressway riding, but at the mention of the Venus Line, I just had to change my plans. It took me many miles and several hours out of my way, but those few hours made the difference between a very good day and a glorious day. Now that I’m obsessed with photography, I think maybe it’s a little annoying to ride behind me. Go put together an amusing video of me location scouting—slowing down and/or pulling off at every single overlook trying to find good spots for photos. But I think all that reconnaissance paid off: this shot↑ was taken one minute into that video , while the one below↓ was at around four minutes in. 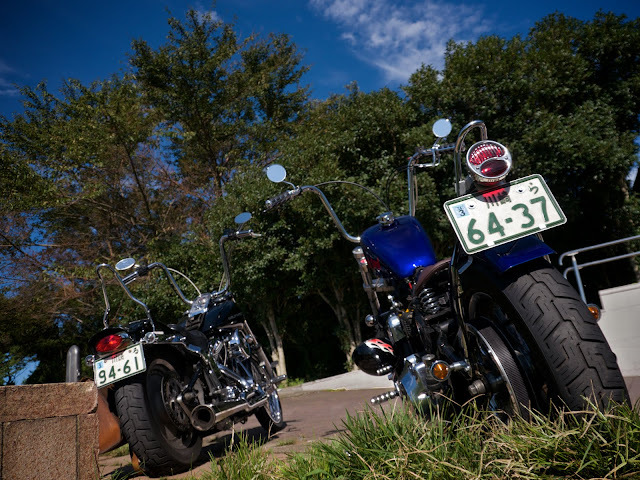 Another unplanned benefit of the timing of this trip was that Vibes Meeting (one of Japan’s largest biker rallies) was being held that weekend along that route, so we were constantly passing and being passed by other Harleys. One of my favorite bits of footage from Go’s fork-mounted action cam was when we passed by hundreds of bikers lined up to get into the campground (at 2:10 in the video). I’ve mostly stopped going to rallies these days, preferring to camp with friends, but Vibes was always one of my favorites, and I still love the feeling of converging on the site along with legions of other bikers. 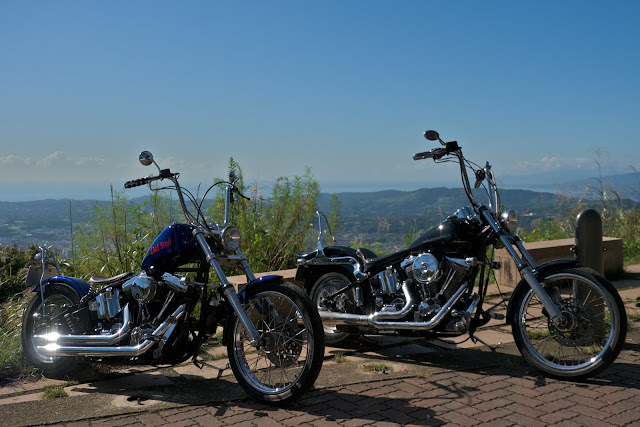 With no real planning, I got to feast my soul on gorgeous early autumn weather, the feeling of biker community, photo geekery, and one of the most beautiful winding roads on the planet, with one of my best friends. 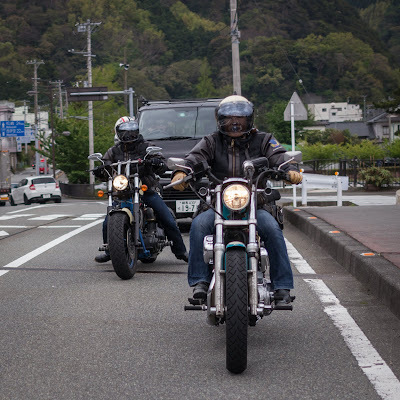 I split up with Go at Kirigamine, and he headed back toward Fuji to find a campsite (and it turns out he then ran into our friend Shu-chan and rode with him for a while as well). I continued along the Venus Line to Mitsumine overlook, and looked back to admire the beautiful winding road I had just enjoyed. After a spectacular day like that, the wine that night tasted even better than usual. The next morning, I decided to drop by to see Chris, since I was in the neighborhood (for a very broad definition of “neighborhood”), and we rode together for a bit for the first time in decades. After a brutal week at work, that weekend was exactly what I needed. 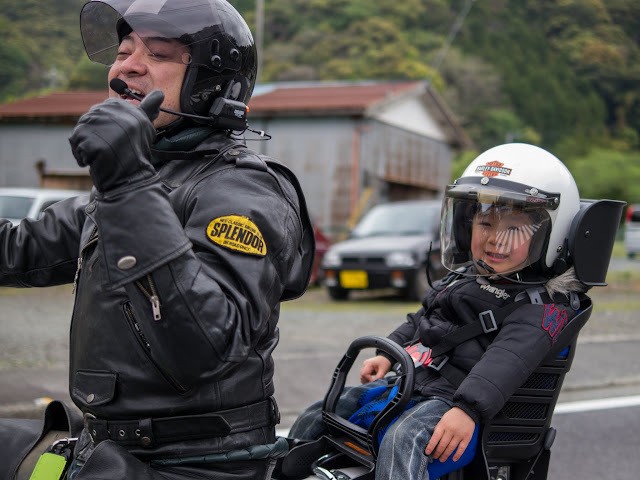 My daughter, Lin, got some great shots from the back of my bike on our touring trip to Izu in April. On thing I love about the Hakone Turnpike in spring is that the steep change in elevation means the cherry blossoms are always blooming somewhere along the way. Lin managed to take one of the coolest pictures of Go ever. I’m glad my daughter has learned to love these winding roads as much as I do. 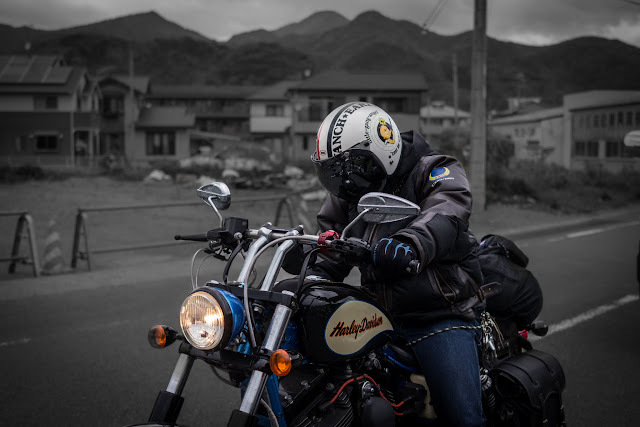 Stinger and I woke up a little early a few weeks back to take a quick ride up to Yabitsu Pass in the hills of Kanagawa Prefecture (the closest ride we could find that had anything that felt like real mountain roads). Even a few hours of riding under these skies really helped clear the mind. Since Yuri first got pregnant with Lin more than eight years ago, I’ve been dreaming of going on touring trips with the whole family on two bikes, and now we’re finally doing it! This is only the second time Yuri’s had anyone on the back of her bike, much less loaded up with camping gear, and Mai’s never done a long ride before, so we picked a relatively close campsite in Susono, at the foot of Mt. Fuji. So the ride itself wasn’t too exciting, but there was comparatively little traffic since it was the weekend after the Golden Week break, and the weather was great. The girls even got to surprise Yuri with a Mother’s Day gift of wildflower bouquets they gathered at the campground and a chocolate bar Lin bought the day before and hid in my saddlebag. Even though this was mostly a practice run for later camping trips and rallies, we had an amazing time, the girls had lots of fun, and Yuri got a good chance to put her Sportster through its paces. Here’s to lots more to come! Another great ride, even though we faced a few more obstacles than usual. I got an email from Go the night before, saying that the security system on his Harley had drained his battery. He then charged it overnight and was able to join us for most of the ride, but that set the general theme. 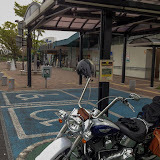 On the morning of the ride, I was just about to head out when I got a call from Ami-chan, saying that she had made it partway to my neighborhood and stopped at a convenience store to find that her bike wouldn’t start. I grabbed my jumper cables and rode to the rescue, and at first it looked like a jump was all she needed, but then the bike died again, and it was clear that it wasn’t charging even at high rpms. We managed to juice it up enough to make it to my house, when all of a sudden gasoline started gushing out of my carburetor. It turns out I had damaged the fuel hose when I adjusted the carb float the week before. So for a while there it looked like Ami’s bike had no electricity and needed a new regulator, and mine needed a new fuel hose, which you can’t buy at 7AM. We were beginning to resign ourselves to the idea we wouldn’t be able to make it, when I noticed that the regulator plug was hanging free on Ami’s bike. Some idiot mechanic had disconnected it to change the oil filter, so she was running without generation. I then found ways to jury-rig a fix for the fuel hose while we charged Ami’s battery, and we left a little less than two hours late. Knowing how slowly large groups move, we figured we might even be able to catch up, and we were right. We met up with everyone at the entrance to the Izu Skyline, one of my favorite roads anywhere, and I set up my new secret weapon, the gorillapod flexible camera tripod. For the rest of the trip, I experimented with various ways to mount the camera, and got the low-quality video I’ve embedded above. 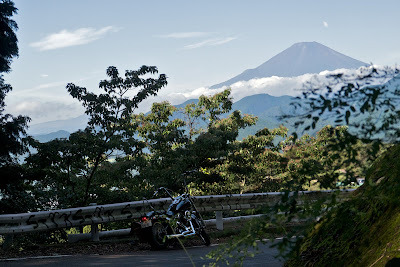 I think it shows some of the flavor of spring riding in Izu, though. We stopped for a late lunch at Spice Dog in Shimoda for the best curry on the Izu peninsula. 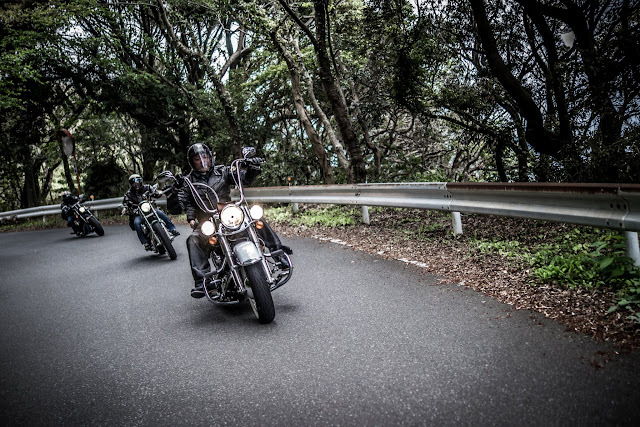 It started to get cloudy, so rather than taking the usual route around the coast past Irozaki, we took a chance with a road none of us had tried before that turned out to be a fun ride over Jaishi (Snakerock) Pass. Unfortunately, none of the video I took there was usable, but the memory is plenty. And I can never resist taking a few shots of my bike with cherry blossoms, especially with the color of Noji’s Z2 in the background to set it off. The next day, we got in more great riding, only to have Yos’s front tire go completely flat at a gas station. Luckily, I was able to locate a tire shop willing to help us out—iPhones come in handy in unexpected ways—and we were able patch the tube and get back on the road without too much delay. Just to cap it off, my rear turn signal cover flew off on a mountain curve, and while Ami was able to find the lens, the mount escaped somewhere, and I had to make do with electrical tape. But in all, the problems we had on this trip all came with pretty good timing: Ami’s battery died in range of my house, where we could charge it. My carb leaked in front of my garage, where I had the tools to fix it. Yos’s tire went flat sitting still at a gas station in one of the few towns we passed through big enough to have a tire shop, rather than at high speed on one of the mountain roads where we spent most of the trip. And who cares if I’ve got tape on my turn signal? 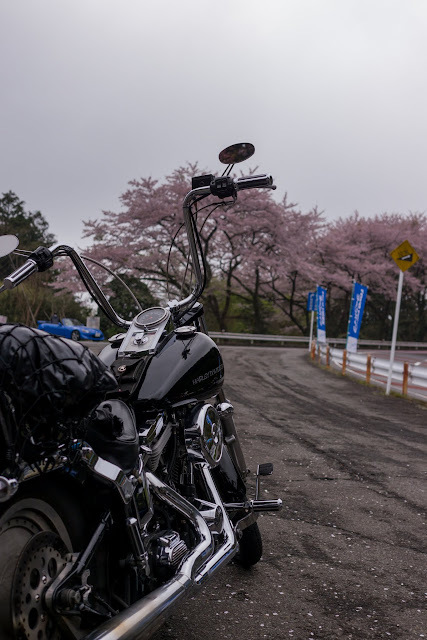 All these little complications just added to the adventure, and couldn’t keep us from having an amazing ride with good friends in great weather under the cherry blossoms. The muse isn’t moving me to write a real touring report, but we had another great ride, mostly along the same route as last year. This time, my old friend Kaze joined us from Osaka, and we got some great shots with his helmet cam despite the overcast. Unfortunately, the clouds mean that you can’t see the Pacific Ocean on both sides of the peninsula, but I think it turned out OK.